Thank you to everyone who has offered their help and have been so patient with us as we try to devise a plan. Many wonderful ideas were sent to us, our guild members had many fabulous thoughts, and we discussed them all at our meeting last night. We know you want something tangible to go to the victims of these horrific tornadoes. We have had many offers of completed quilts, and due to limited man power on our end, we have decided to ask everyone to send completed quilts to our guild rather than blocks. It could be a quilt you have waiting for a good home, a new one you want to make special just for someone in need, it can be modern, traditional, any size, any colors, made by an individual or a group. You send us your completed quilts and we will get them to those in need. Quilts will be due to the OKC Modern Quilt Guild by June 30th. If you e-mail us at okcmqg@gmail.com we will get an address to you. Our guild will also be creating two quilts to raise money for two charities in the form of a drawing, as money is a big need for that area right now. That post should go up about mid June so please stay on the lookout for that one! Thank you for your outpouring of support, love, positive thoughts, prayers... and quilts! Hey everyone, it's Andrea here bringing you the block of the month for May! 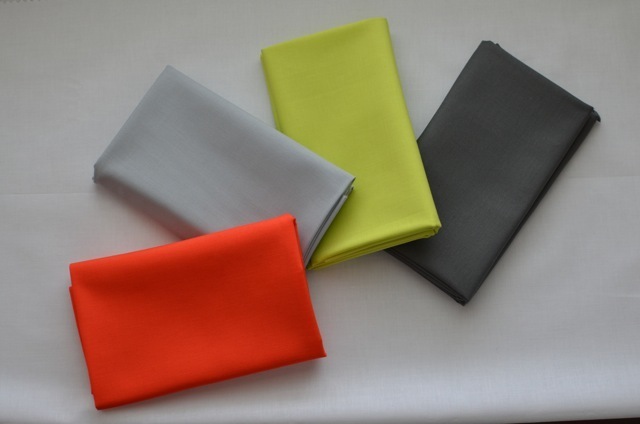 I have a fat quarter pack of the Michael Miller cotton couture QuiltCon colors that I’ve been dying to cut into. When I saw this block I thought it could be very cool to vary the colors from block to block using the QuiltCon colors. 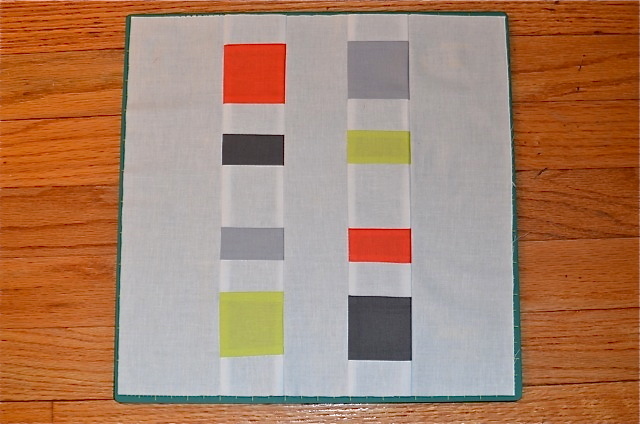 The block is called “Binary” and is designed by Angela Pingel. While it looks simple enough, it is important to be precise in your cutting so that everything lines up properly. 1. 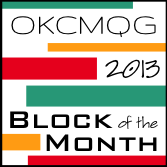 Using my completed block photo as a guide, arrange the two columns using the 1 ½” x 2 ½” white and colored rectangles and the 2 ½” x 2 ½” white and colored squares. 2. 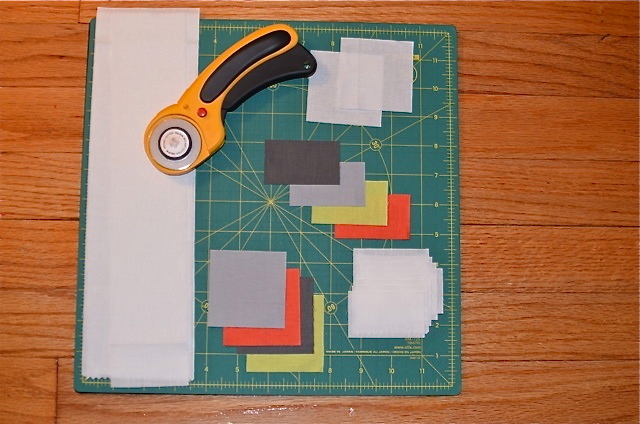 Sew the colored pieces to the white pieces using a ¼” seam allowance with right sides together. 3. Once your two columns are complete, take them and sew to either side of the 2 ½’ x 12 ½” white strip with right sides together. 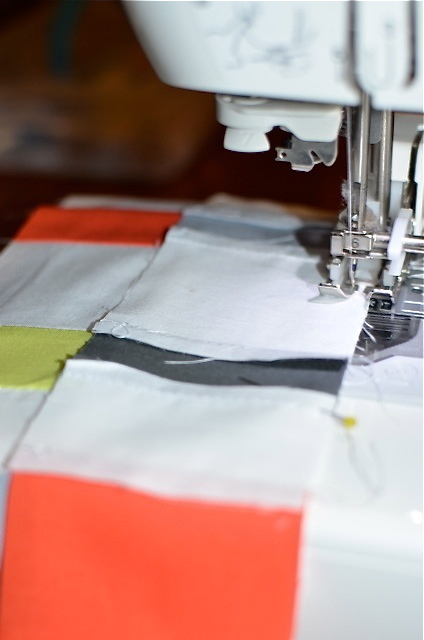 Press your seams away from the pieced columns. 4. Add your 3 ½” x 12 ½” white strip to either side of your block from Step 3. Press the seams away from the pieced columns. Voila! You are finished!! 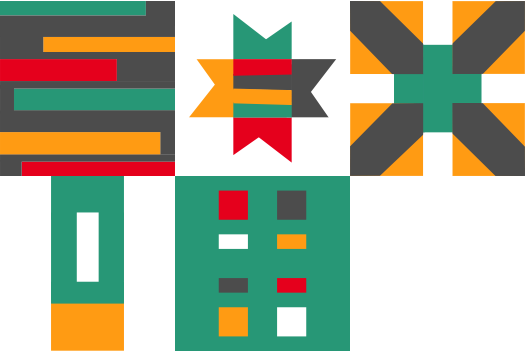 This block has a lot of possibilities including, but not limited to, rotating the block 90 degrees or switching up the colors from block to block. For those of you at home keeping score, here's where we are!